Bali feel and affordable price. Serves Balinese rice mix and kosher! Worth a try if we are visiting Bali (when we are in the area of Ubud, Seminyak or Denpasar because this stall has a number of branches. Psychologically probably feels more fitting when we tried which is located in Ubud since the atmosphere of the place and its surroundings. Located in the House, surrounded by various types of orchids and other ornamental plants ... beautiful like the bali people page. You are interested in food from seafood or better known as the seafood? If you're on holiday in Bali or maybe planning want to Bali, Jimbaran heard or also Kedonganan. Kedonganan and Jimbaran is two villages nearby and has beautiful beaches. 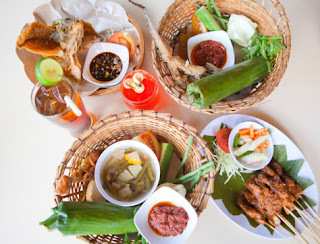 What is unique in comparison to the beach in Kuta, Dreamland, Nyang Nyang or more, if here in addition to enjoying the atmosphere of the beach you can also enjoy savory seafood. Many people complain the issue price of eating seafood at Jimbaran beach or Kedonganan. The price is too expensive. But now You never have to worry again eat seafood at Jimbaran beach or Kedonganan, because balitopholiday seafood packages provided with very affordable price starts from IDR 120,000/pax in Jimbaran bali Seasoning Furama Cafe, Jimbaran grilled fish. Bali Resto Panoramic window is a great place for lunch or dinner with authentic Balinese cuisine while enjoying the beautiful panorama of the island of Bali. The restaurant is situated in the attractions of the Garuda Wisnu Kencana (GWK). View interesting and picturesque jimbaran-kedonganan and airports it seems clear from this resto. eating while enjoying the beautiful landscape is highly recommended for those of you who happen to be into tourism GWK.. Designed as a cafe with a spectacular panoramic view of Bali, Bali Window is the most suitable place to finish the day where visitors can enjoy the sunset.